"Amazing Location 1/2 a block to the beach and surf!" Address: Super nice town home, 1 min walk to the beach! Come see for yourself, this town home is beautiful! Spacious and open floor plan with very luxurious finishes. 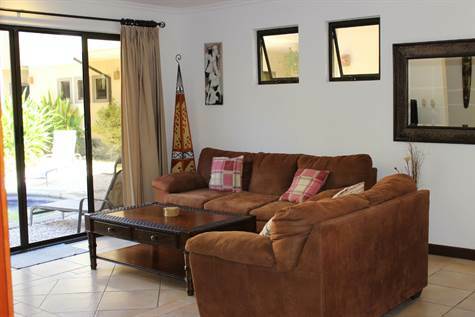 The property offers off street parking, and has a gated and secure entrance. 5 town homes share a nice pool with tropical garden landscaping around and an outdoor shower for rinsing off the sand from the beach. The beach and surf waves are only 1 min walking distance from the complex! You and your guests will love it! The unit has been a very good rental investment, and rents for an average of $1,000 per week. The kitchen has stylish granite counters, and custom wood cabinets, with a center island and is great for entertaining. The dining room and living room are spacious with modern furniture, all in like new condition. The downstairs offers one master bedroom with en suite bath with tropical garden shower. There´s also a half bath for guests to use. Upstairs there are two more bedrooms, each with their own bath, a spacious landing area that could be used as an additional living area or small office. There´s a shared covered deck overlooking the canopy of trees.